The stupendously clever duo, Adam Wallace and James Hart, are at it again with the newest release, in their best-selling Jackson Payne series, Disastrously Daring! This time Jackson Payne finds himself teeing off at the green. “Golf is a nice walk. It’s a great way to be in the fresh air…it’s the most amazing sport ever…” he’s told, as Jackson’s dad has his heart set on Jackson becoming a golfing superstar. But Jackson would rather be at home sinking battleships than sinking a long putt on the golf course. And everyone knows that Jackson + Sports = Disaster! He might be extraordinarily clumsy at golf, but when Jackson suspects there is more to snobby club member Darnell, than meets the ‘black’ eye, Jackson accidentally saves the day in the most unusual way. With its witty and signature slap-stick comedy, including a gastronomically funny sketch of misunderstanding with his Nan, this laugh aloud, rollicking, action-packed chapter book is ideal for the reluctant reader. Disastrously Daring! 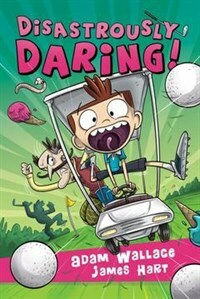 Is a hilarious read particularly for young boys, but is sure to thoroughly entertain people of all ages.